As I mentioned in my last post, I had to leave Cades Cove about noon, and was wondering if my bear mojo was failing me and I would be skunked for bears on this trip (you may recall I am a big fan of bears and enjoy observing them). But, a couple of miles outside of the valley I came across a so-called bear jam. It was attended by a ranger who was trying to keep visitors that were out of their cars from getting too close to the bear and keep those in their cars moving so as not to clog the road. He was having more success with the first objective and the lone bear was foraging up a steep slope and moving away from the road so photo opportunities were limited. Still, it was good to see one at last, so I contentedly continued on through the park. 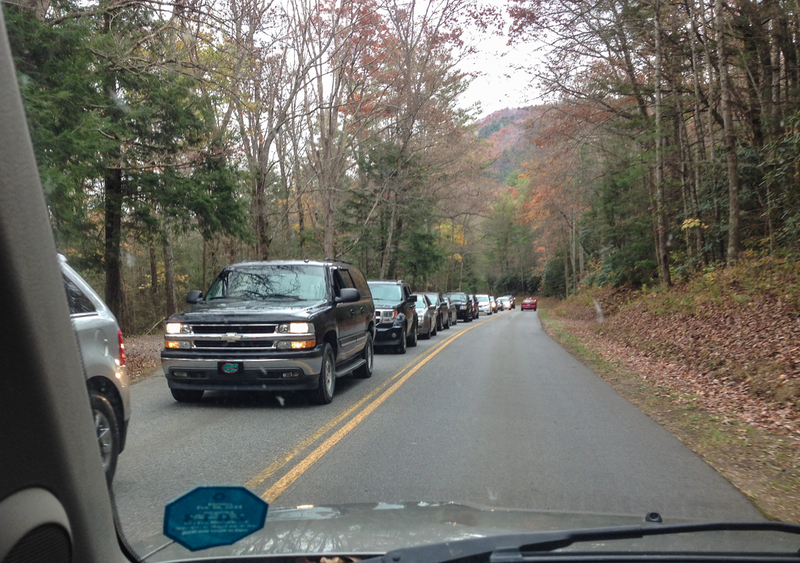 My plan was to drive through the primary road in the park which puts you out in Cherokee on the North Carolina side. 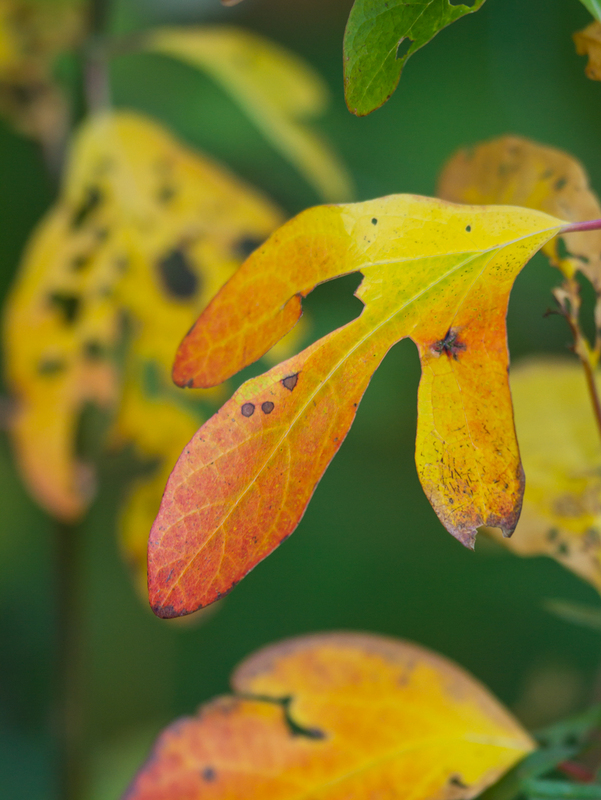 Many of the trees had already lost most of their leaves, but there were still lots of spots with beautiful fall colors. 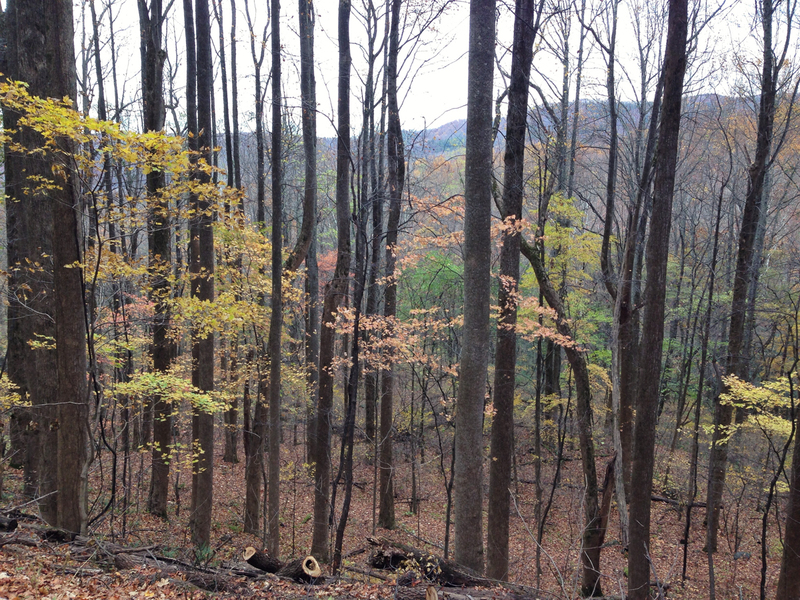 I was intrigued by the splashes of color I saw down some of the steep wooded slopes. The day was overcast and the combination of dark tree trunks with bright yellows and reds looked like an inviting photo op. I stopped at a pullout that looked promising and got out to photograph the scene. As I am looking down-slope and composing a couple of images, another car pulled in and I saw a guy point at something. He asked what it was and when I looked up I was thrilled. It was a bear! Actually, there were four bears, and they were high off the ground in the tops of two trees. Surprisingly, the other car drove off leaving me alone with the bears. The mother bear was feeding on wild grapes which were abundant in the tree tops on many of the steep wooded slopes along the roadway. The three cubs were all lounging, presumably napping, as they barely moved at all in the 25+ minutes I spent with them. The large female climbed higher while I watched and was probably 60-70 feet off the ground in the top of a Tulip Poplar when I set the camera up with my long kens to photograph her. Her cubs were almost as high and had balanced themselves in various ways amongst the tangle of branches and vines. When I looked through the lens, I could see why they had bothered to make the climb – the vines were loaded with clusters of grapes. Black Bears are opportunistic feeders and take advantage of the seasonally changing food availabilities. 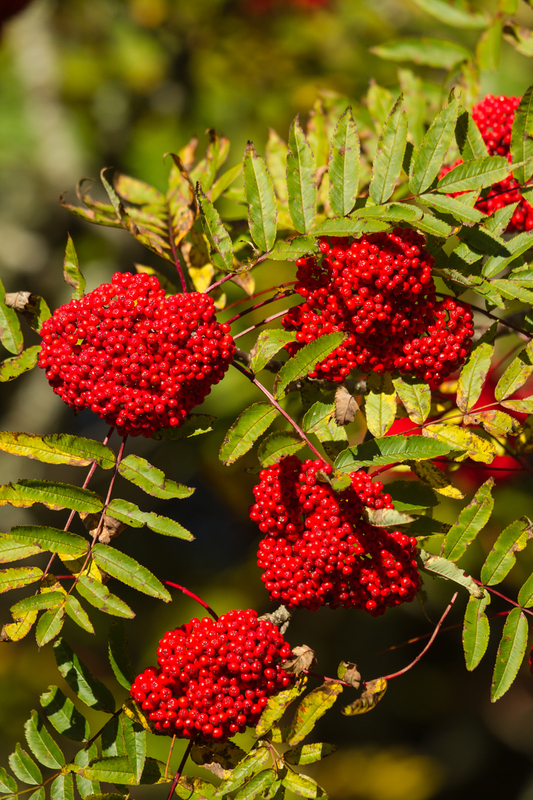 In autumn, nuts, berries and fruits of various sorts become a critical component as they feed voraciously in preparation for the winter hibernation. The audio is from all the people that stopped once I set up the telephoto lens pointing skyward – a sure sign there must be something of interest to see. If you listen carefully at the very end of the video, you can hear this gentleman thanking me for allowing him to photograph the bear as seen on the LCD screen of my camera using his iPhone. 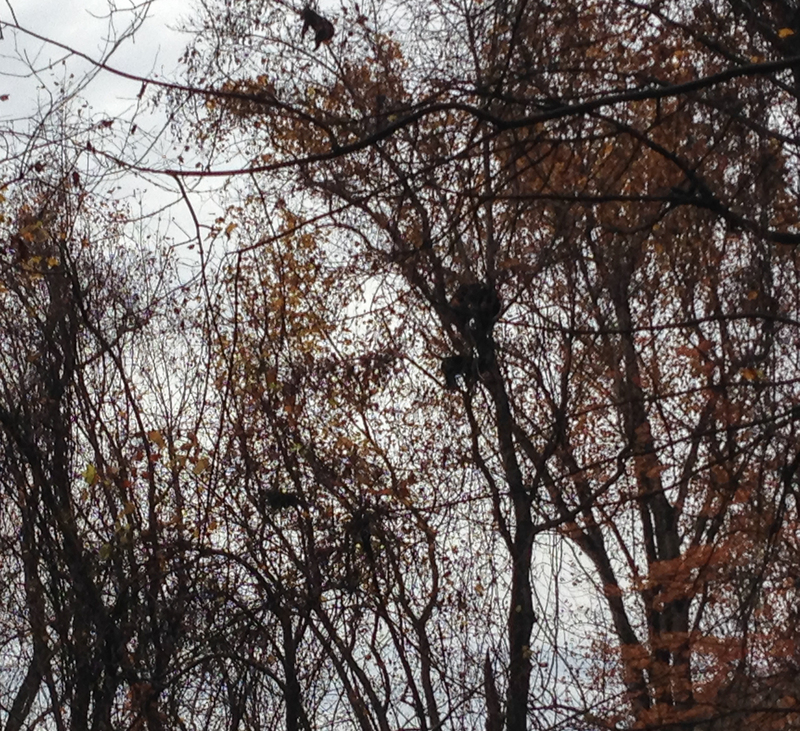 Many of the people that stopped and asked me about the bears were surprised that the bears were up in a tree feeding. 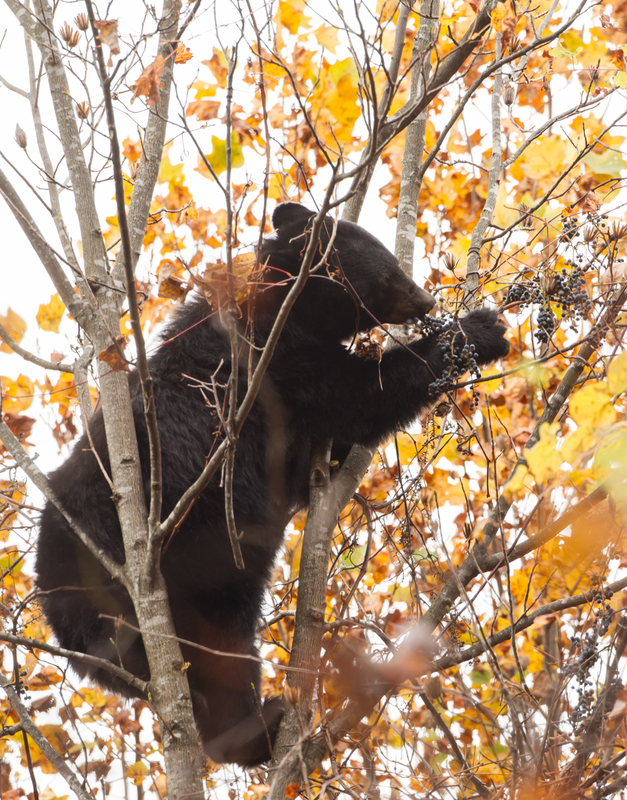 It reminded me that this was the third time I have seen bears in the Smokies in trees eating grapes. I have also seen bears in other areas eating wild cherries in tree tops and know that they feed on acorns as well. 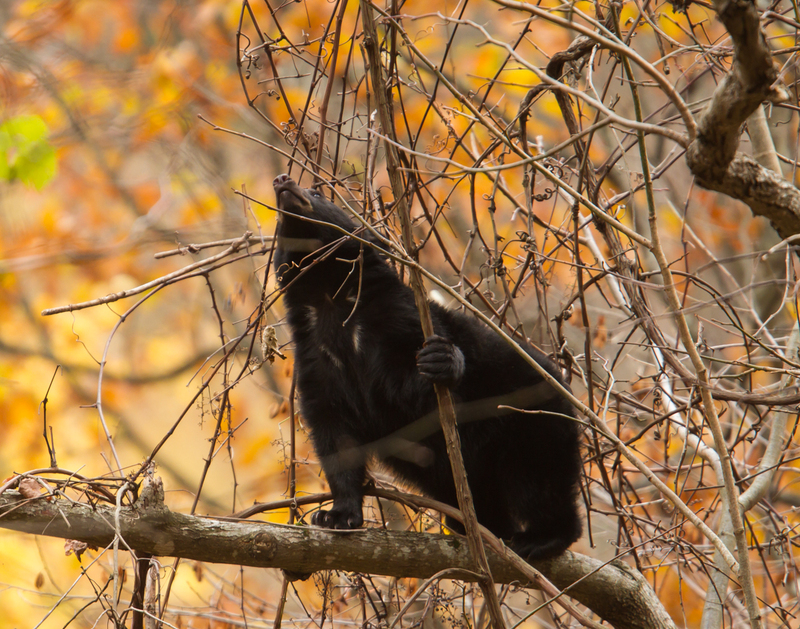 Climbing to reach these foods gives bears an advantage over competing deer, foxes, and coyotes, who must wait for the fruits and nuts to drop before they can eat them. The scene started to become a bit chaotic with more and more cars stopping so I packed up the gear and managed to get out before gridlock set in. I muttered my apologies to the bears for drawing attention to their feeding, but, they really didn’t seem to mind. 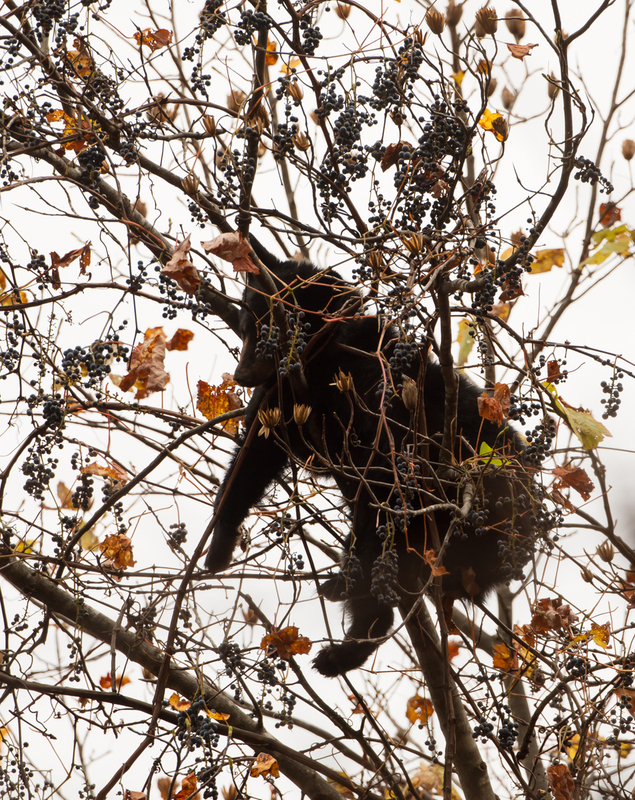 About twenty minutes later I came across another line of traffic, and, amazingly, there was another bear up in a tree feeding on grapes. This was a slightly smaller bear than the first one, but, as I soon found out, it was another mother bear. As the gathering crowd watched, a young bear who had been sleeping at the base of the tree (but was hidden from view) started climbing the trunk toward the other bear. It climbed to a horizontal limb and began grabbing vines to pull grapes within reach. It ate a few and then walked back and forth a couple of times along the skinny limb which was about 30 feet above the ground. The young bear looked like a high wire artist as it nimbly moved from branch to branch, and only once caused the crowd to gasp as it slipped before grabbing a limb. 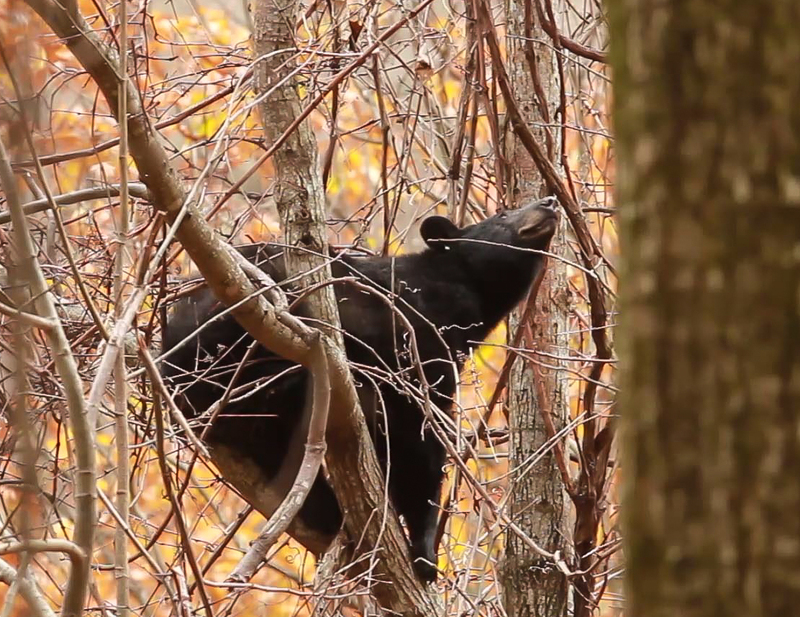 I noticed the adult bears both used their teeth as aids in climbing and shifting position up in the smaller branches. The young bear tended to be on larger limbs and did not show this aptitude as yet. With increasing traffic (the line of cars coming in the opposite direction stretched about 3 miles when I left) and shortened tempers on the part of many drivers, I decided it was time to leave. As I was packing up, both bears came down the trunk and headed down slope. So, in a little over an hour I went from no bears to seven bears, with six high up in the trees. Guess the mojo hasn’t left just yet. 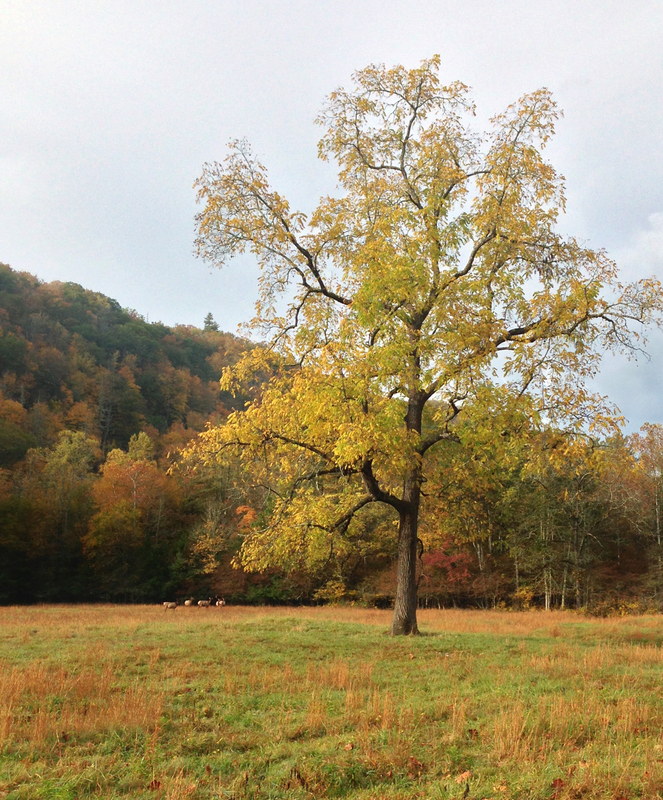 Cades Cove is a 6800 acre valley on the Tennessee side of Great Smoky Mountains National Park. 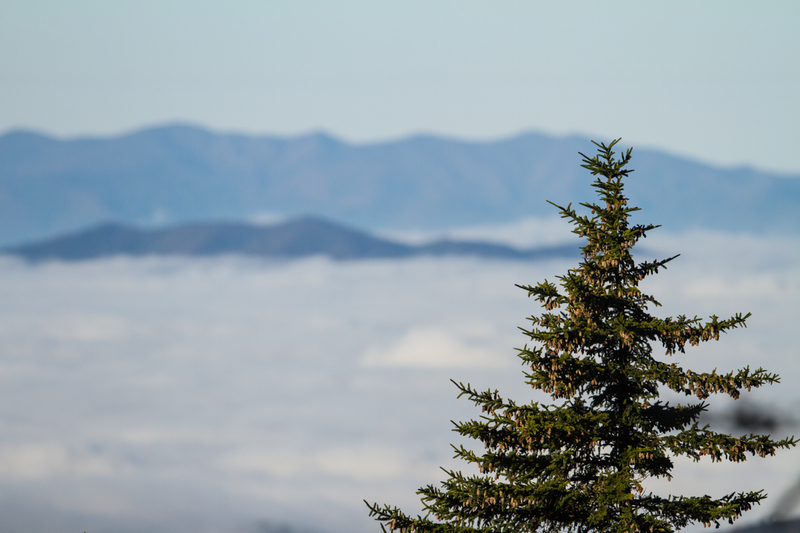 It is probably the most visited area of the park and the Smokies are the most visited national park in the United States with more than 9 million visitors each year (Grand Canyon is second with about 4 million). 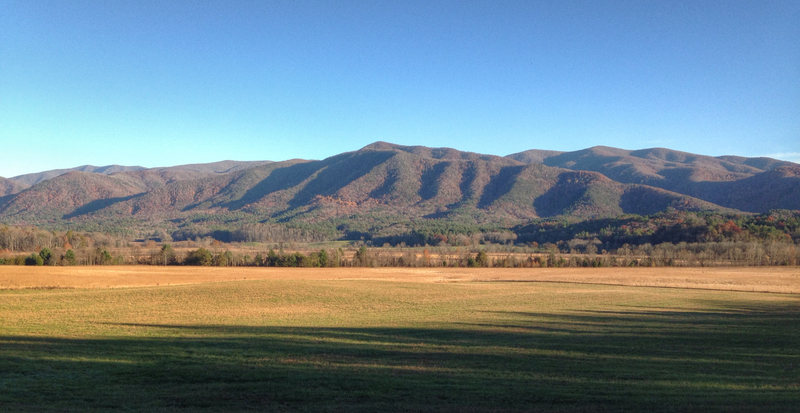 And I can believe that Cades Cove is that popular as each of the four times I have been, it has been crowded. This past week was my first autumn visit and I was expecting fewer people, but I was wrong. The valley is a beautiful place, especially at sunrise and sunset. There are many short trails, a visitor center, streams, and scenic views. 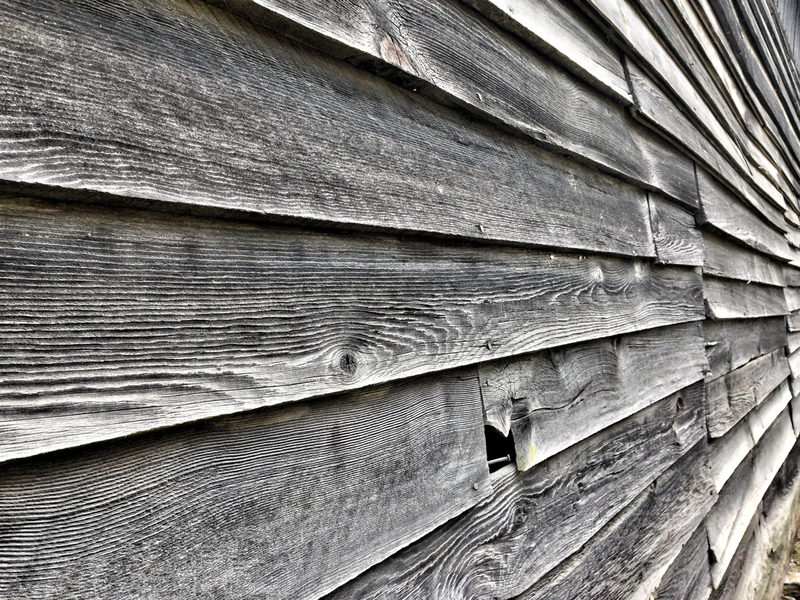 There are also a large number of historic structures from the thriving community that lived in the valley until it became part of the national park in 1934. One reason for its popularity (and the reason for my visit) is its wildlife. 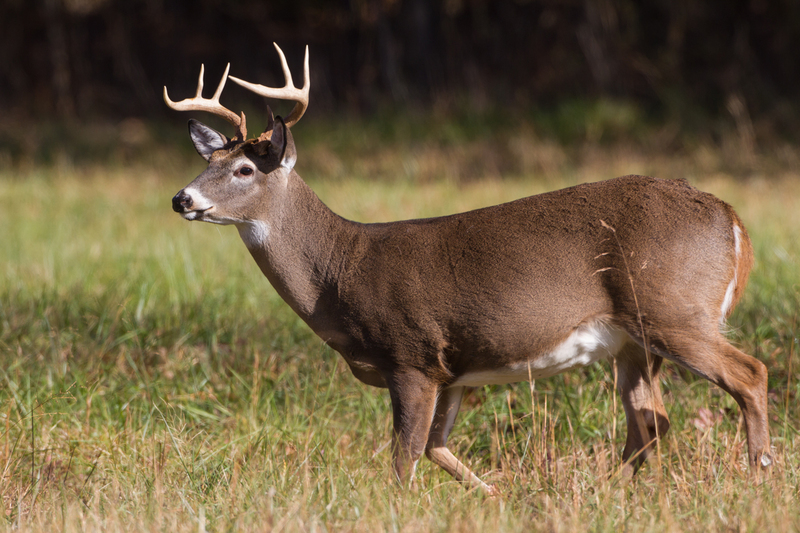 Cades Cove is well known for its abundance of species such as White-tailed Deer (especially large bucks), Wild Turkey, and Black Bear. There is easy access provided to the valley via a one way 11-mile loop road. 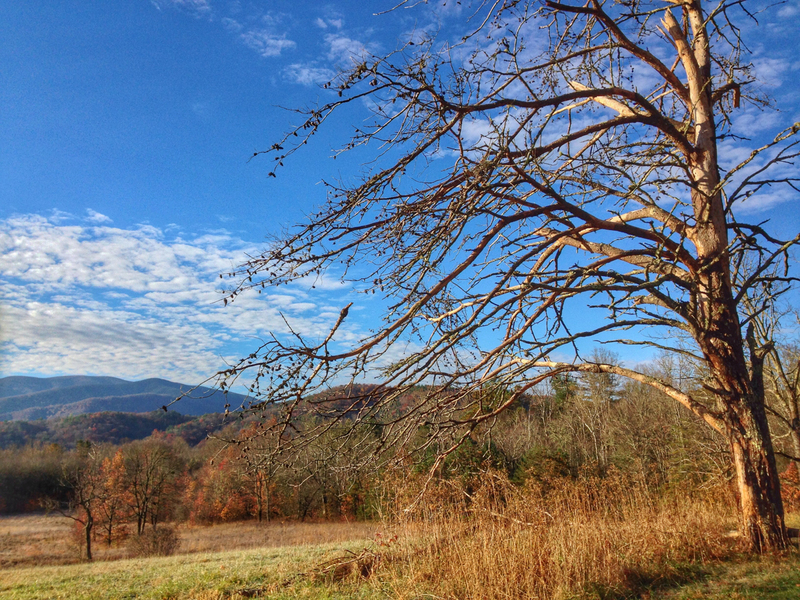 The area offers excellent habitat and relatively easy wildlife viewing with its mix of meadows, managed fields, hardwood forests, and mountain streams. I arrived late in the afternoon last Thursday and, after hurriedly setting up my tent in the campground, headed out to see what I could find as it was approaching prime wildlife viewing time. 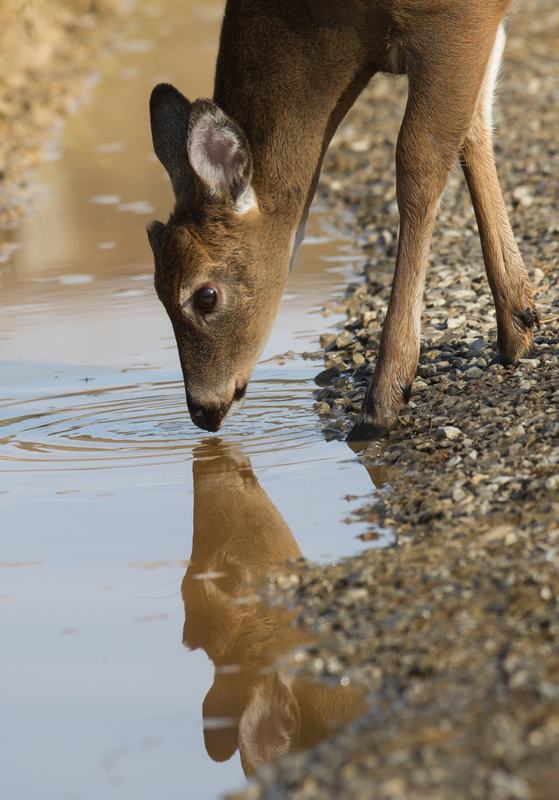 A few hundred yards past the entrance to the loop road, I came to a field with several large bucks feeding. There were a few folks out watching so I grabbed the camera and walked out. There were five bucks – two 10-points, one 8-point, and two 6-points, an impressive start. 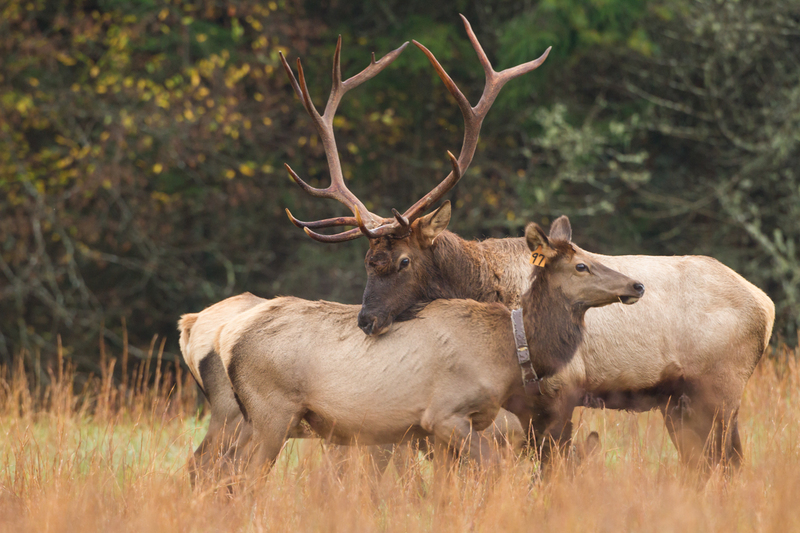 One thing that is great about Cades Cove is that most of the wildlife is very accustomed to people and so it is a great place to observe behaviors. 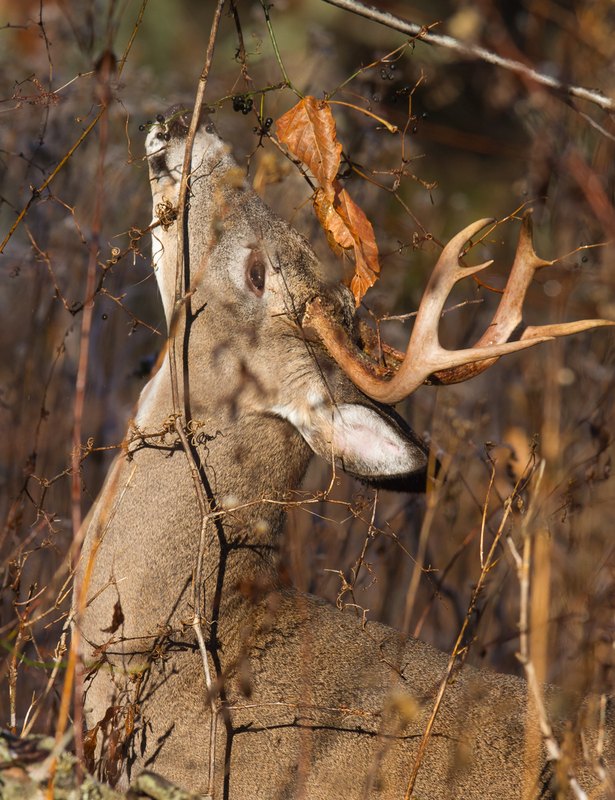 While the rut is still in progress, I think some of the passions have subsided. 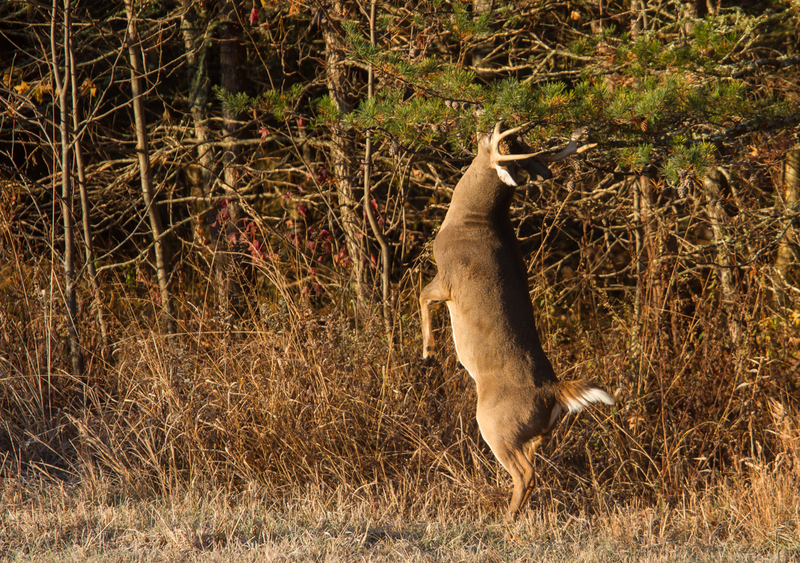 But one large buck started thrashing a downed trees’ branches with his antlers and another soon joined him. The larger buck then started licking the antlers of the slightly smaller one, they briefly locked horns for a very passive shove, and then moved off together to feed side-by-side. 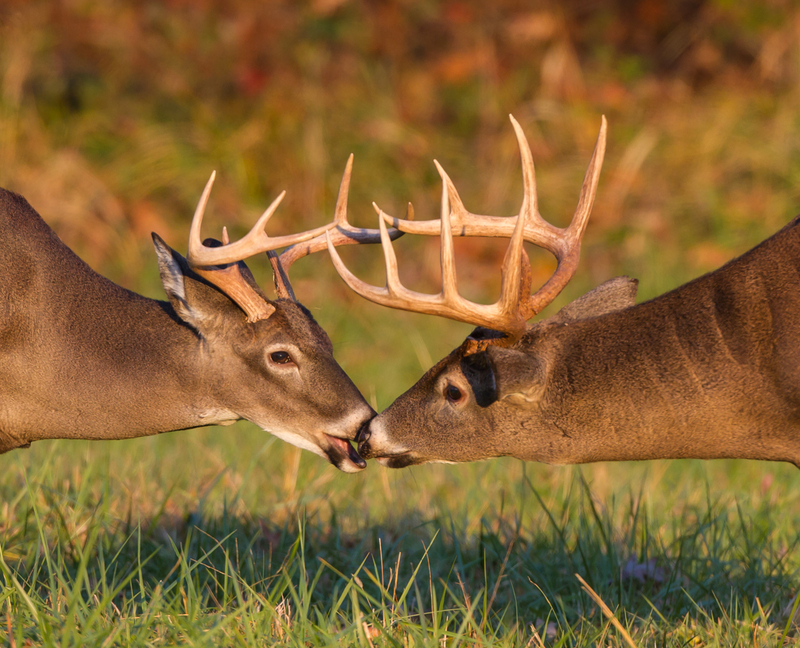 Two other bucks touched antlers and then brushed noses as if whispering something about one of the other guys in the field. I finally drove the remainder of the loop road as the sun was setting and looked for places to check the next morning. 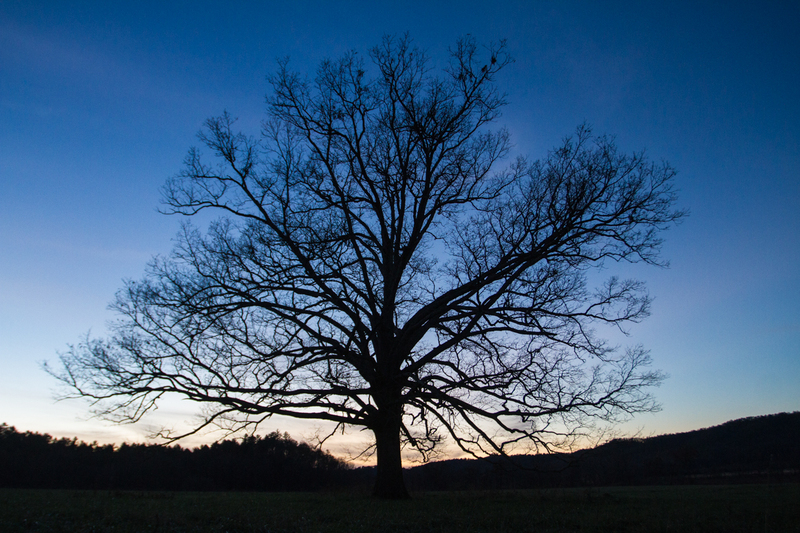 As I photographed a particularly beautiful tree out in one of the meadows, I heard coyotes yipping a few hundred yards away under the clear, darkening sky. 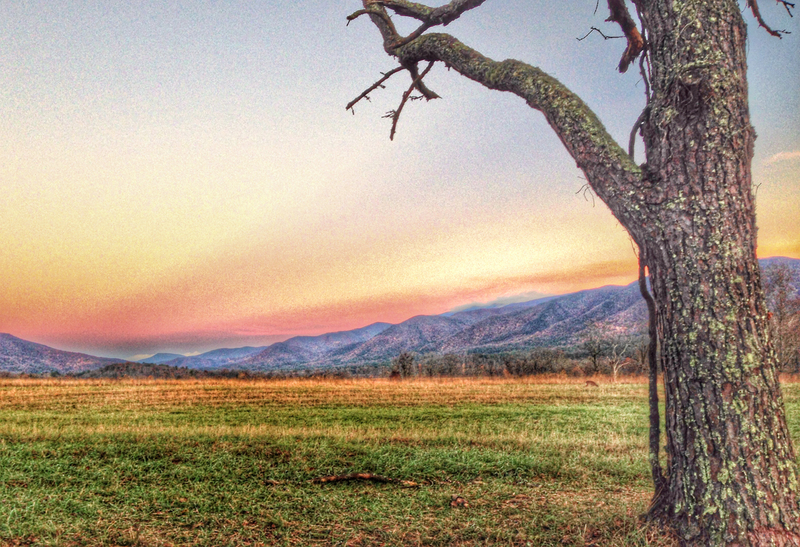 A great ending to my first afternoon in Cades Cove. I awoke about 4 a.m. and headed out into the cold air toward the bathroom when I heard some rustling in the leaves about 20 feet from the tent. In the moonlight, I could see a dark form and my first thought was bear (there are warnings about bear-proofing your campsite). But when I turned on my flashlight it was a Wild Boar, an introduced species that the park is actively trying to control. They grub through the soil looking for whatever they can find to eat and, in doing so, root up large amounts of plants which can damage sensitive habitats. It looks like a small bulldozer has gone through an area after they are finished feeding. The Boar trotted off and I gladly moved off in the other direction. The next morning there were twenty cars at the entrance to the loop road when the ranger opened the gate at 7 a.m. I drove past the field with all the bucks (and most of the cars) and was soon by myself in the upper end of the valley. 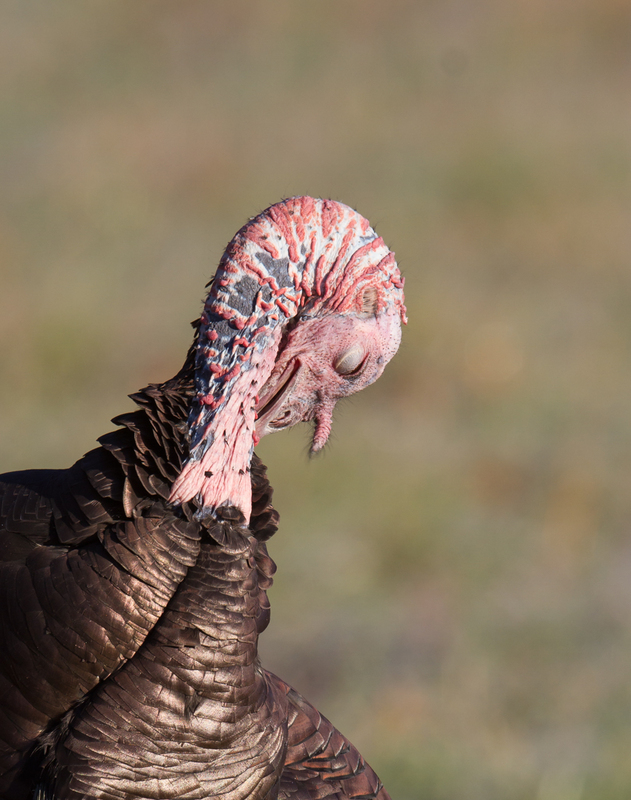 A few turkeys flew down from their roost and landed in a nearby field so I stopped to watch. They were picking through the grass for who knows what and then walked over and grabbed a few berries from an American Holly. I had just sat down to photograph them when they started to head my way. 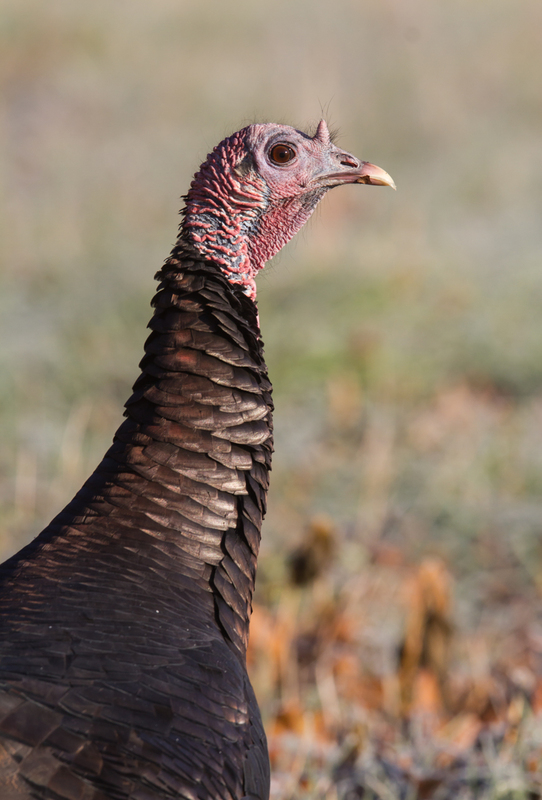 I was soon surrounded by turkeys, scratching in the leaves under a nearby Sycamore and pecking at unseen morsels. 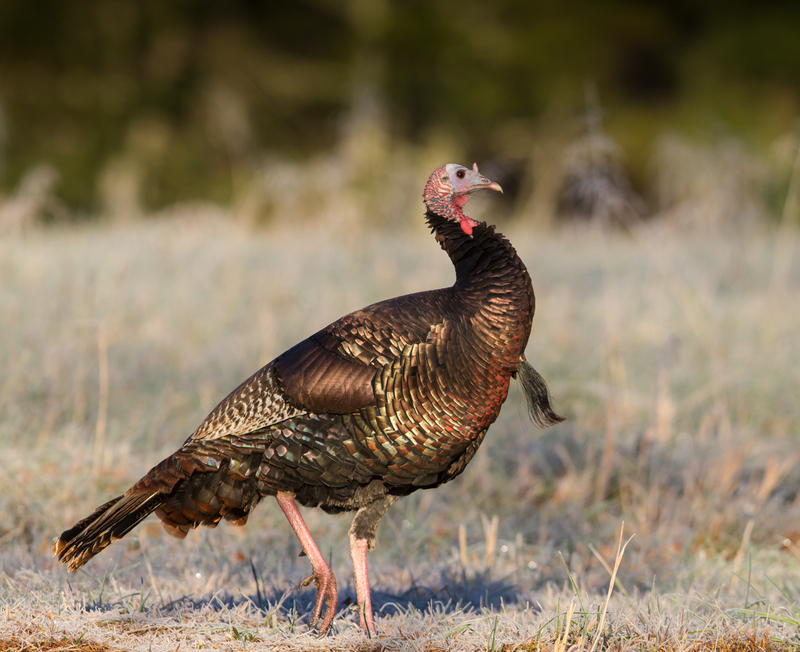 As the light started to hit them, their feathers made them shimmer with bronze, green, and rich rust colors. As beautiful as their feathers are, their heads are a bit on the not-so-beautiful side, especially with the close looks I was getting. They continued to peck and feed, glancing my way occasionally to make sure I had not moved from my cold, sitting position in the icy grass. I sat with them for about twenty minutes until a diesel pickup truck stopped nearby and spooked them. With the increasing traffic, I decided to hike up into the woods near where I had seen a large buck the afternoon before. On top of the hill, I saw movement just inside the woods. 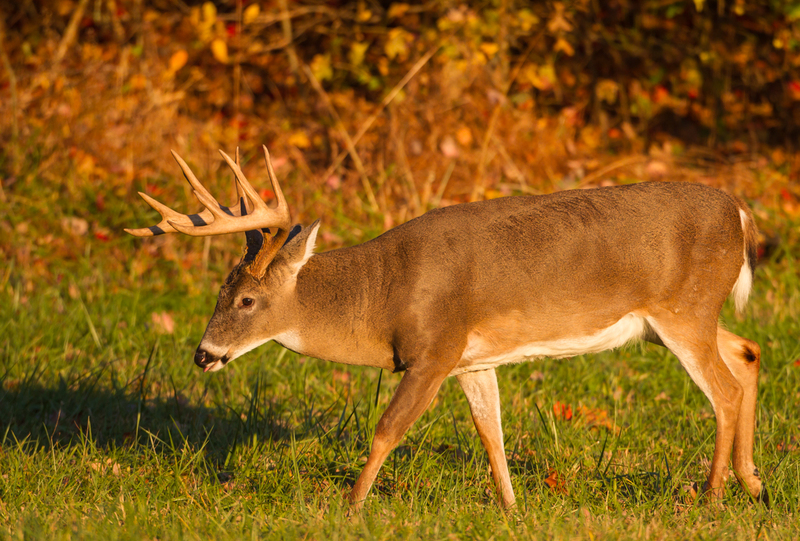 A small 6-point buck was stretching his head up and grabbing something. Only when I later looked at the image could I see he was feeding on Greenbrier berries (Smilax sp.). I have seen them eat the shoots of Smilax, but never the berries before now. Walking down into the woods I came a cross a small herd of deer, all female. Suddenly they all jerked their heads to the left and stared into the woods at something I could not see. A very large 7-point buck then came into view, chased away the does, and started to feed. I moved one step to the side to get a better view and he spotted me and turned my way with nostrils flared and mouth agape. I interpreted that as a “I could take you but I’m going to let you live” look and I didn’t move again until he nibbled his way off into the forest. Driving back to camp later that day I was happy with the wildlife observations except for one thing – no bears. But I still had one more morning. The next morning was in the 20’s with another heavy frost. I drove out to the far end of the loop road and was, again, relatively alone as most had stopped at the first field with all the bucks. 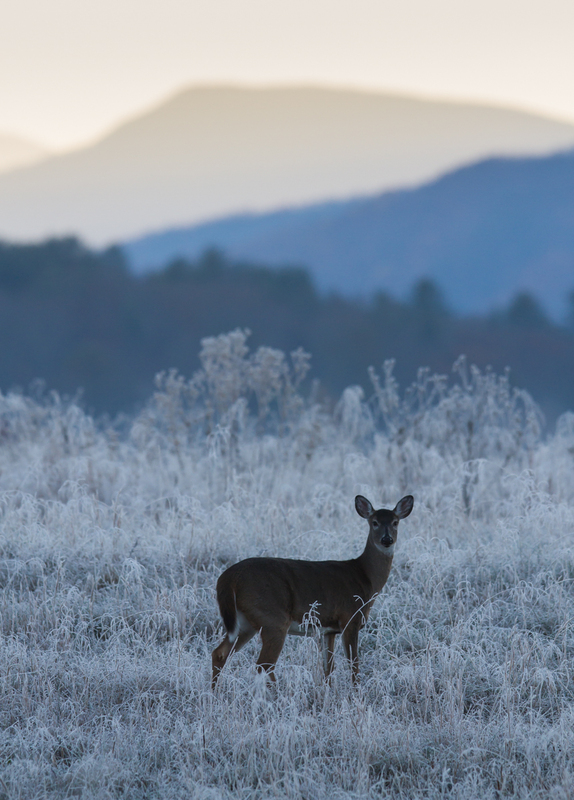 A lone doe was at the edge of the frozen meadow when I spotted something trailing her – it first appeared as just antlers in very tall grasses and saplings, but then became a large, frosty buck. 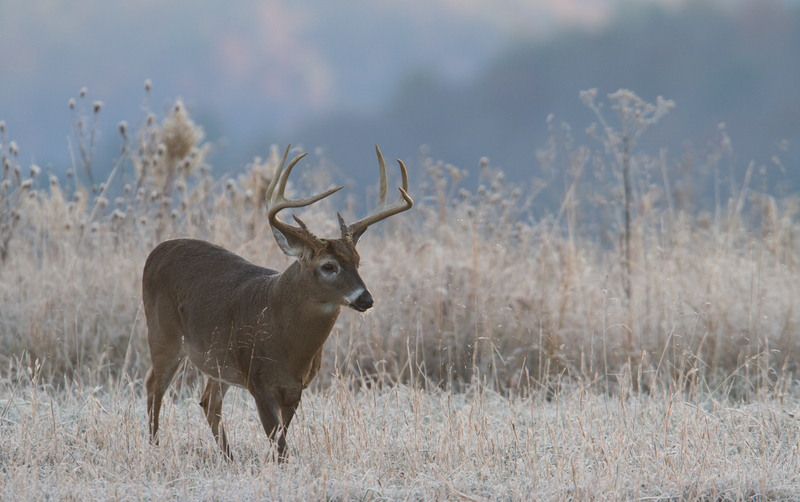 His antler spread was impressive as he stared at the disappearing doe. I stayed put and he trotted across the field, pausing once to glance at an oncoming car, before retiring into the edge of the woods. I hung around watching some turkey and small groups of birds (Eastern Bluebirds, American Goldfinches, American Robins, Golden-crowned Kinglets) as they swept through feeding on whatever they could find in the crisp morning air. 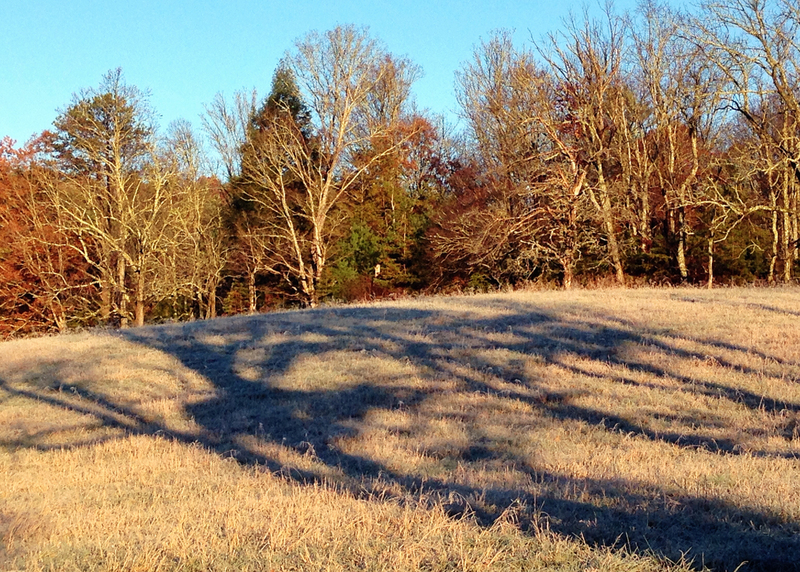 But soon, the rising sun melted the frost and warmed the valley so I headed back over to where the buck had vanished. 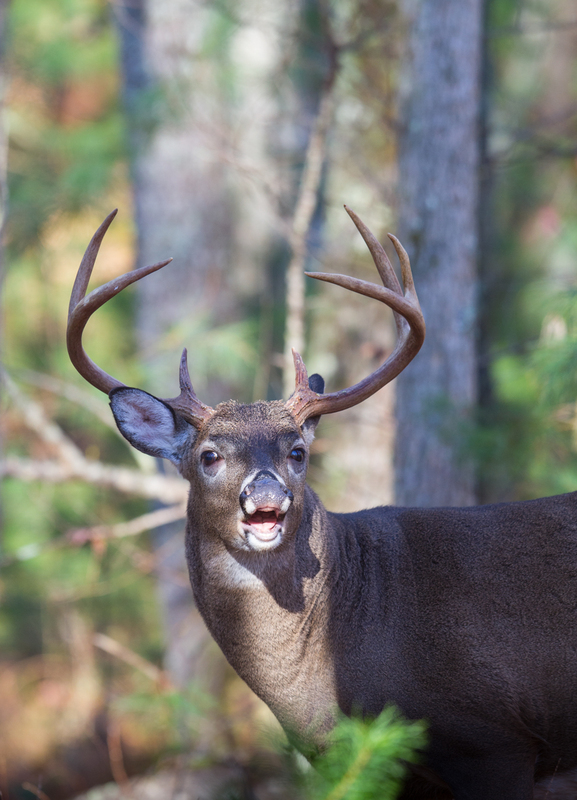 I saw a large buck, which I assume was the same one, although I can’t be sure as it was turned away from me. It started making a scrape, in which the buck paws at the ground, exposing moist soil. After pawing at the ground a few times he urinated in the scrape and then reached up to am overhanging branch and rubbed his head back and forth. This deposits scent on the branch from his head and from glands in the corners of their eyes. 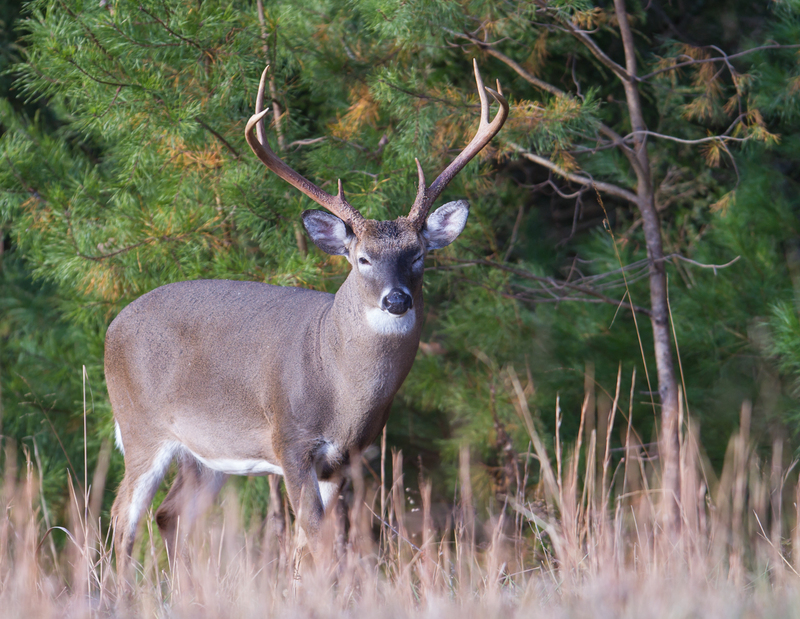 The scrape serves as a signal to all other deer of his presence and his status. I don’t know about the other deer, but I was impressed. I drove on as traffic started to increase hoping to find a bear before I had to break camp and leave. Far out in a meadow I instead spotted three bucks moving in an unusual manner. I pulled over to look and it appeared as if they were in a three-way sparring match, heads down, antlers touching, and slowly spinning in a circle testing each other. I grabbed the camera and headed out, when, of course, they broke apart and started feeding (guess all that testosterone-induced activity makes a guy hungry). They slowly drifted apart as they browsed and I managed a few photos of the largest of the bucks, a compact 8-pointer, as he kept an eye on his departing opponents. 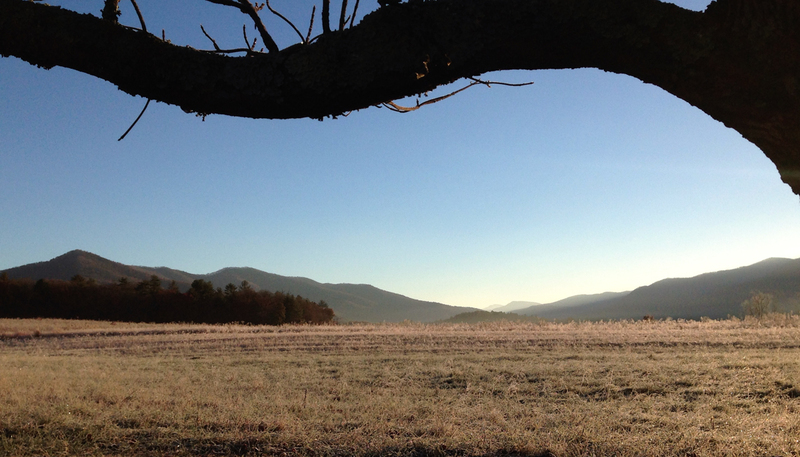 It had been a rewarding couple of days in Cades Cove. My only frustration was the traffic congestion. It was made worse by two things: drivers ignoring the signs saying “no stopping” and “please use pullouts to observe wildlife”; and drivers going half or less of the posted 20 mph speed limit without pulling over to let others pass. I also saw a few visitors get way too close to deer (within feet). This explains the signs that read “Do Not Feed, Touch, or Disturb the Wildlife”. 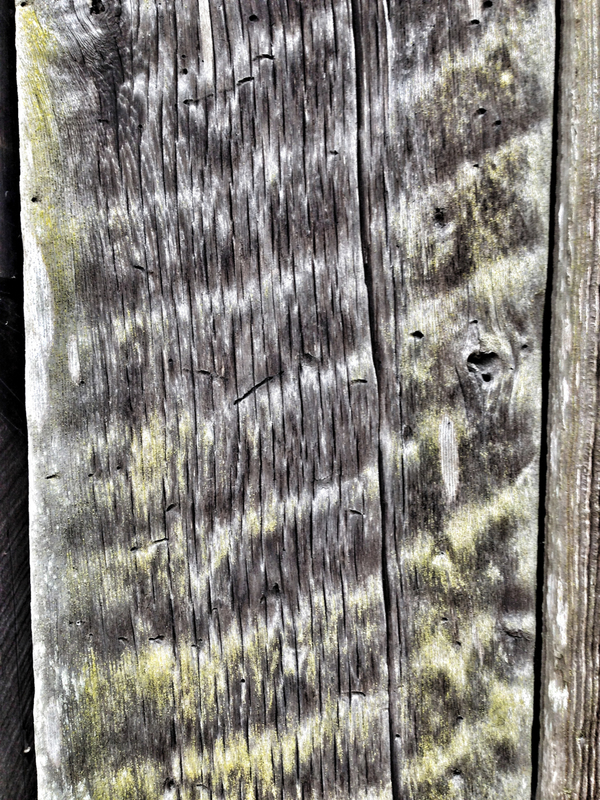 Touch…really, you need a sign for that? My other disappointment was that for the first time in my four visits to this picturesque valley, I had no bear sightings. I was beginning to think I had lost my bear mojo as I drove out…but, such was not the case. But you’ll have to wait until the next post to see why. 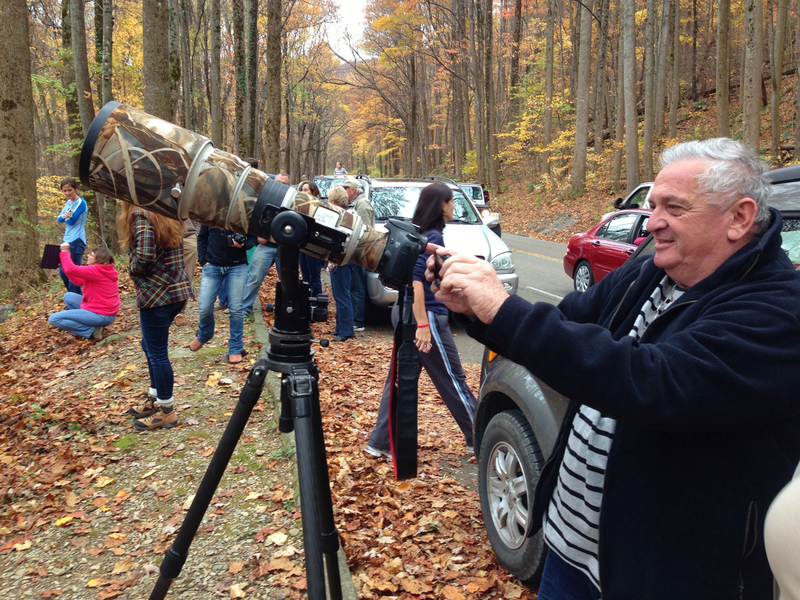 I had an outing this weekend with a great group of folks in Cataloochee Valley and up on the Blue Ridge Parkway. 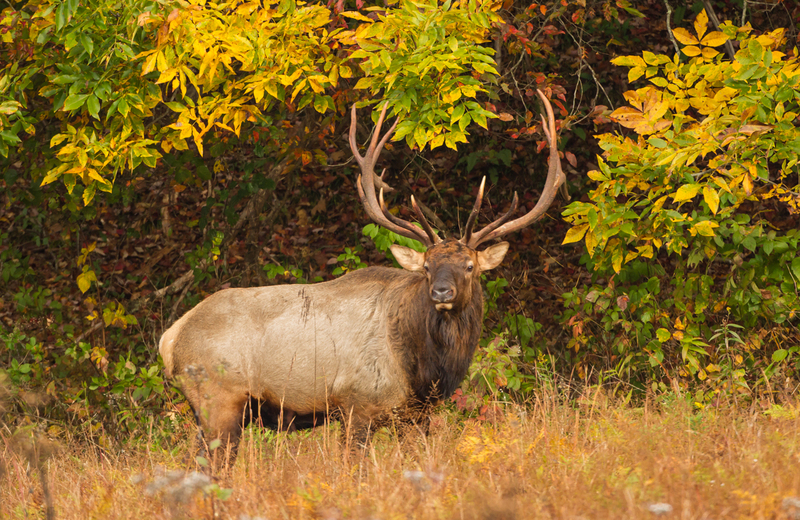 Our goals were to observe the elk during the mating season ritual called the rut and experience the beauty of the mountains during the fall leaf season. I’d say mission accomplished on both. It was overcast and cool on Saturday morning as we drove into the valley. We were greeted at the entrance by one lone bull elk and a little farther down the road a large crowd of visitors at the first elk herd. One large bull was busy herding his harem of cows and occasionally chasing off a small spike bull that was feeding some distance from the herd of cows (but apparently not far enough away for the big bull). 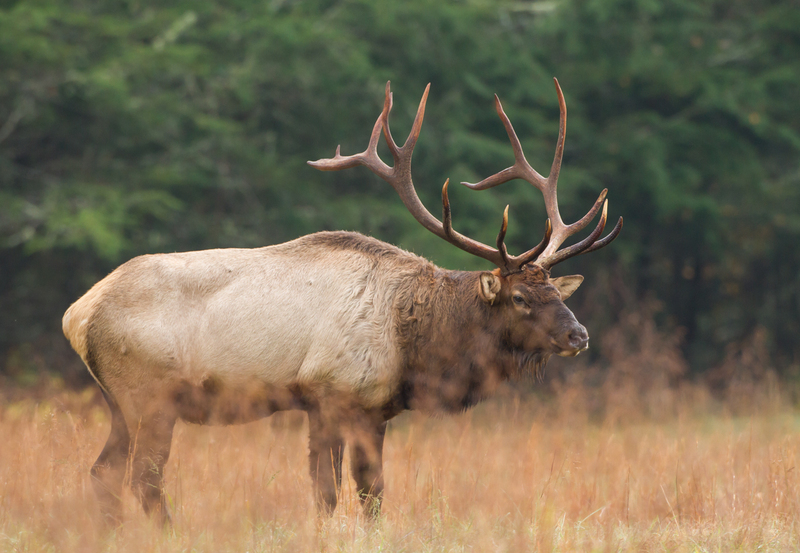 Early morning is one of the best times to see the elk as they tend to be feeding and, during the rut in September and October, interacting with one another. Each year at this time males in their prime (usually 5 to 8 years of age) gather small herds of cows and calves and aggressively defend them from other bulls. 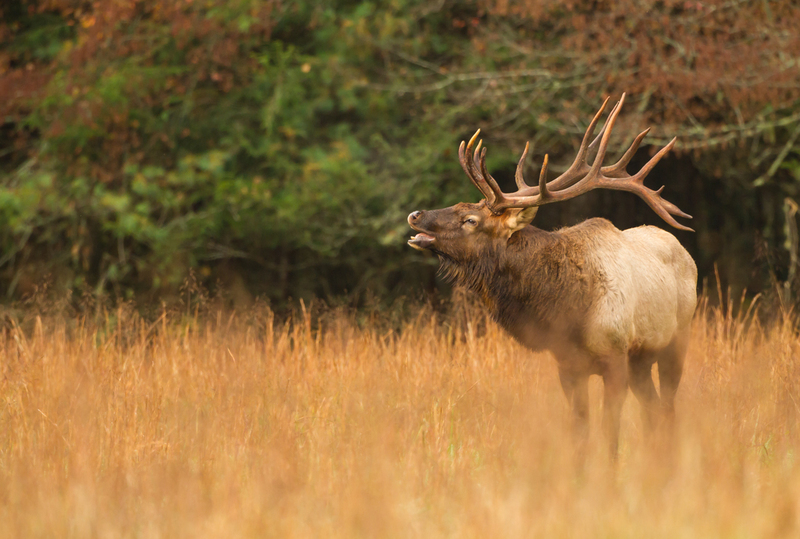 This is done by a series of displays: bugling, a hauntingly beautiful and surprisingly high-pitched call; thrashing bushes and other vegetation with their antlers; and occasionally engaging in sparring matches with other large bulls by locking antlers and shoving in a show of strength. When the cows come into estrus, the mating begins. A cow is receptive for mating less than 24 hours. She won’t be willing to mate again until her second estrus cycle arrives in 20 days so bulls are constantly checking on the cows in their herd. Bulls can be quite aggressive toward cows as they herd them, but then during courtship their behavior is decidedly more gentle. He may approach her and lick her to check her receptiveness and, if she is ready and willing, mount her to mate. 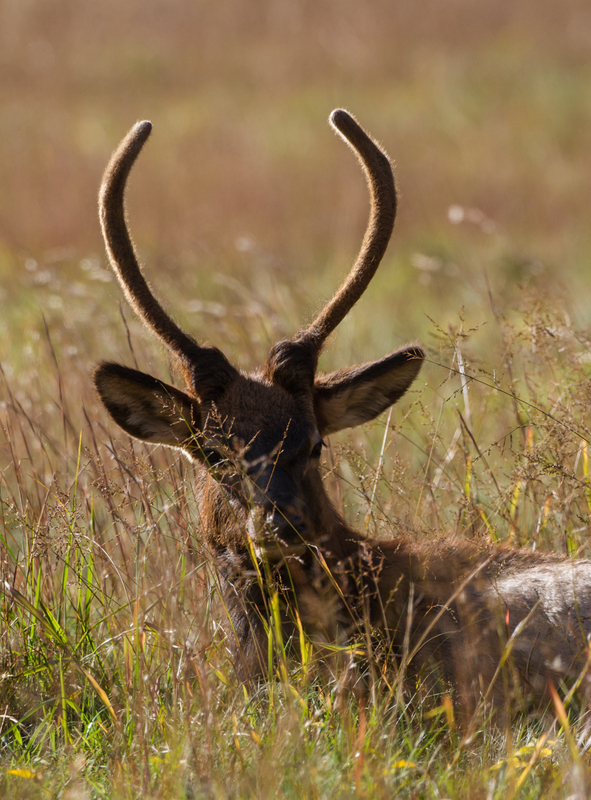 This day had no actual mating or fights with other males, but the bull stayed busy, bugled often, and looked exhausted at times (bulls may lose 20% of their weight during the rut). The rest of the day we explored the woods and stream sides and walked around some of the many historic structures in the valley. 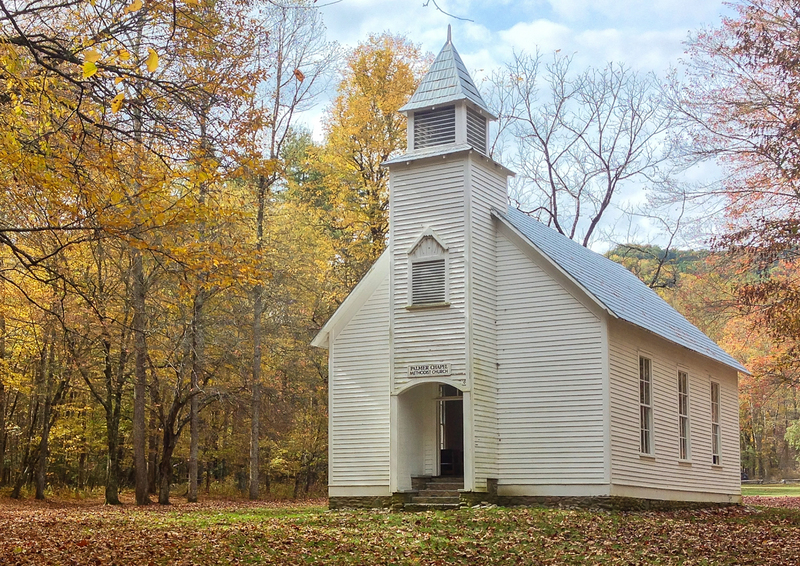 Several houses and barns, a one room school, cemeteries and a church are all that remain of a once thriving community that had to leave when the land became part of Great Smoky Mountains National Park in 1934. There are auto tour brochures available for a nominal fee at the information kiosk near the valley entrance that give a detailed history of the valley and some of its notable inhabitants. Late in the day we found ourselves (along with hundreds of other visitors in often car-clogged roads) watching the elk as they returned to the fields after being in the shade of the forest much of the day. The next morning most of the group wanted to head up onto the Blue Ridge Parkway for some fall color so we headed out and started heading north from Balsam Gap. The cool night and humid atmosphere had created ideal conditions for mist and low hanging clouds, a photographers dream for this time of year on the Parkway. 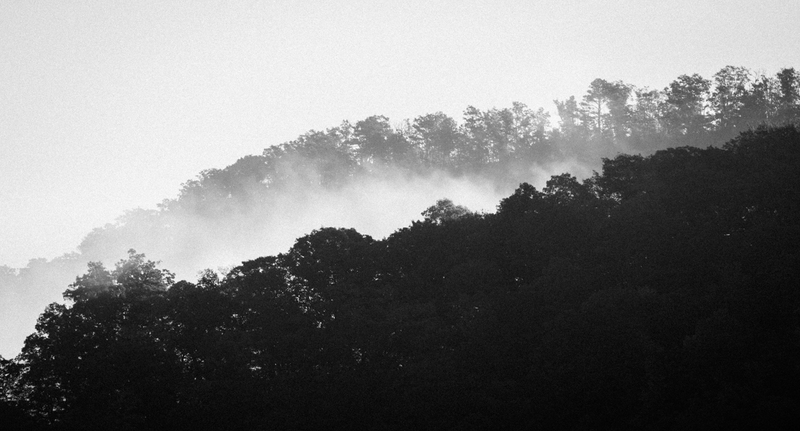 At first, we saw only patches of mist hugging some ridges. 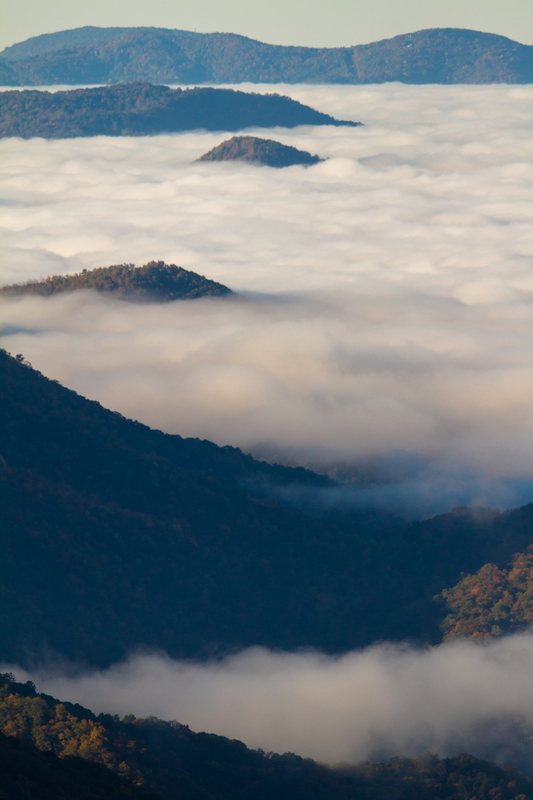 As we climbed in elevation and the road shifted to the other side of the mountains, an ocean of clouds spread out above the valley floor with isolated peaks popping through the gray sea. This type of scene has given rise to the name, Islands in the Sky, for these mountaintops protruding above the misty sea of clouds. It also refers to the unique ecological communities that are adapted to the cold conditions atop our highest mountains. As we continued north, the warmth of the sun caused the sea of clouds to recede leaving us with an unobstructed view of row upon row of ridges speckled with fall colors. Our final stop was a short hike down to Yellowstone Falls, one of the more popular hikes along this section of the Parkway. 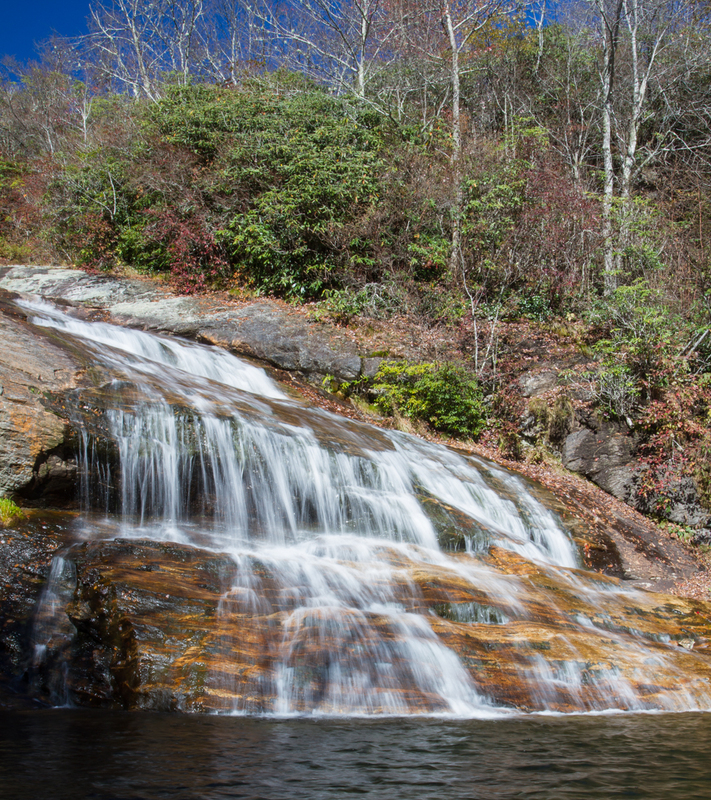 After winding through a thicket of Rhododendron and Mountain Laurel, you come out on a beautiful series of waterfalls. The hike is well worth the steep climb back out. And here’s something to consider next time you visit a popular waterfall. If you are at the top of the falls and look down and see a group of people with cameras looking up at you, try not to stay too long out in the open…they may be waiting for a chance to get a photo or two of the scene without people in the picture. As we parted ways, I think we all were appreciative of the sights and sounds we had experienced on this magnificent fall weekend. 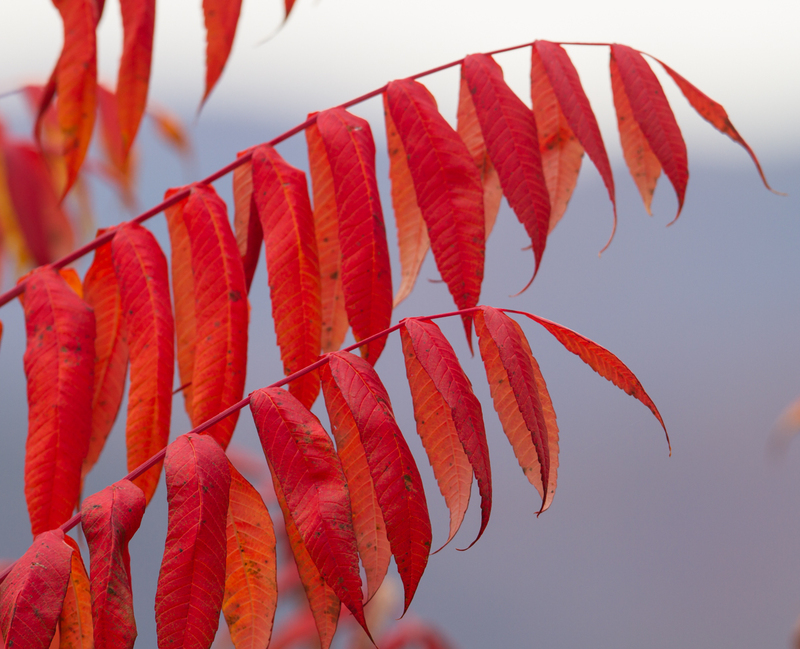 I look forward to the cooler weather and changing landscape and wildlife that the new season will bring.